Honda have released the first official images and technical information about their new rally-inspired adventure bike, also confirming that it will revive the iconic Africa Twin name. 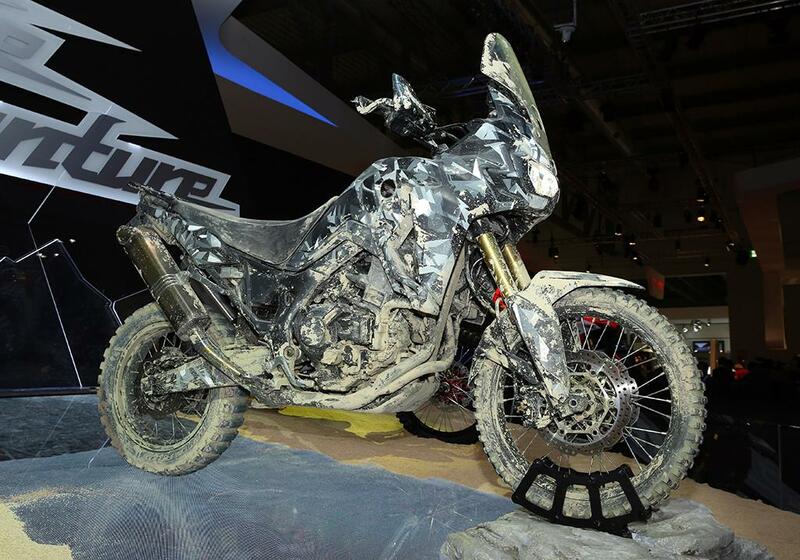 The firm showed a ‘True Adventure’ concept bike at the Milan show in November last year, which looked largely ready for release, but offered scant confirmed detail about the new model, or when it would be unveiled. 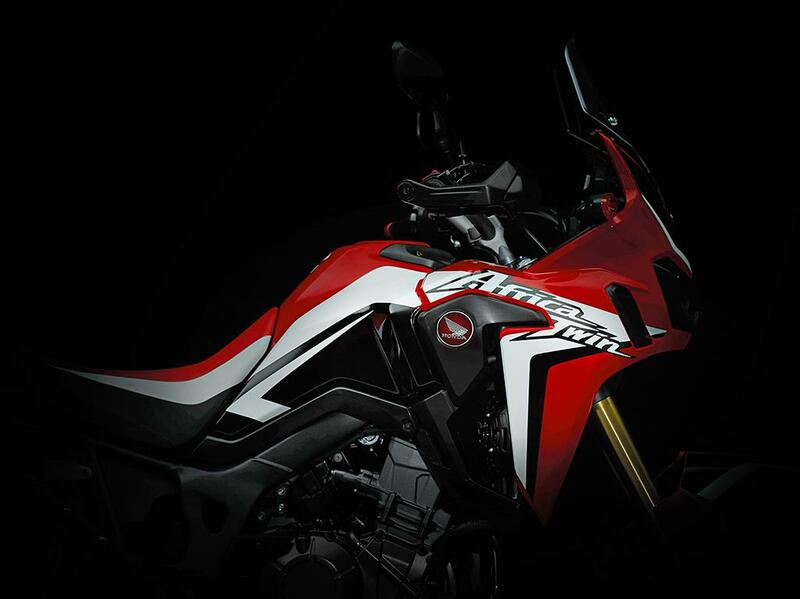 These teaser images reveal much of the missing detail, while Honda have also confirmed that the new CRF1000F Africa Twin will arrive in dealers in late 2015, well ahead of expectation. The NXR750V, a full HRC race machine, faced stiff competition in the gruelling Paris-Dakar through the late 1980s, winning in 1986, 87, 88 and for the final time in 1989. When Honda first released an Africa Twin back in 1988 to celebrate their rally successes, it drew its name from the Dakar bikes and the off-road XR range, the V clarifying its engine configuration. Two years after the XRV650 arrived, the firm upped the engine capacity, and the XRV750 was born, a bike that would stay in production (with two updates) until 2003. 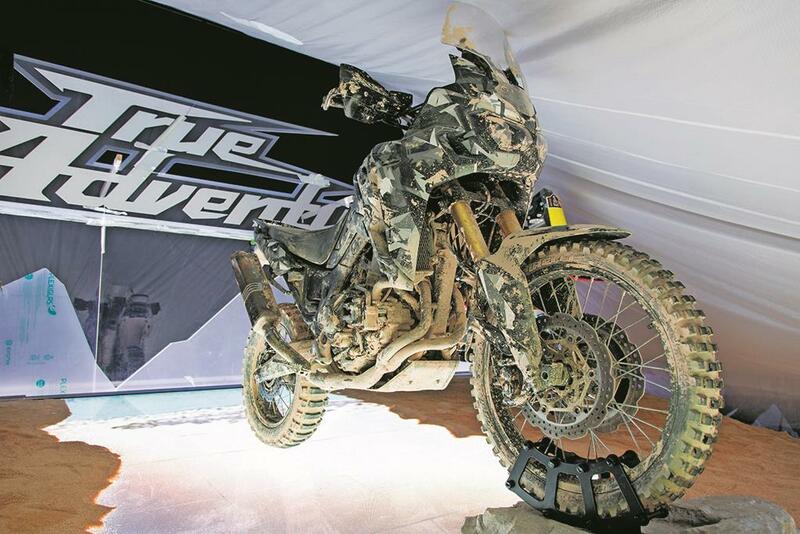 The new bike makes its intent clear by also drawing its name from the current Dakar bike and off-road range. The only magic missing from the CRF1000F decals on its flanks are the HRC initials that added such kudos to the original, while the Africa Twin name carries full prominence on the upper cowls. While it can’t carry the HRC badge, there’s little doubt that the new Africa Twin will boast the necessary skills to cross the continent it’s named after – whatever the terrain. Despite it’s predecessor becoming ever more refined for the road, the new version has made its dirt-loving intent clear from the off. The styling draws heavily on the CRF450 Rally, while the standard trim reflects its adventure readiness. The bars are high, wide and purposefully fat, with handguards fitted as standard, while the footpegs are bear-claw style off-road items designed for grip when the going gets muddy. Thankfully, they’re also fitted with removable rubber blocks for added road comfort and vibration reduction. The wheels are spoked for increased ruggedness, and the standard tyres look aggressive enough to cope with all but the stickiest of terrains, while the ‘petal’ type discs will help fling themselves clean of mud. Above the large all-digital dash is also a bar ready to accommodate a road-book or – more likely – a large satnav (guaranteed to be an offered accessory), giving the rider line-of-sight navigational aids. While many will mourn the lack of a v-twin thumping away in the new Africa Twin, the 1000cc parallel-twin is a far more savvy move by the firm. There are many benefits, but three stand out above all others. Firstly, it’s cheaper to produce a parallel-twin, which in turn allows Honda to keep the price down, while also looking at more beneficial places at which to throw budget and production time – like the optional Dual Clutch Transmission. Secondly, the packaging of the motor provides a useful void behind the cylinders to nestle all the electronics and control systems, nicely protected and contributing to the bike’s mass centralisation. Thirdly, it’s much easier to work on when something goes wrong in the remote depths of your global adventure – and the delivery from a parallel is barely less engaging than a Vee these days anyway. 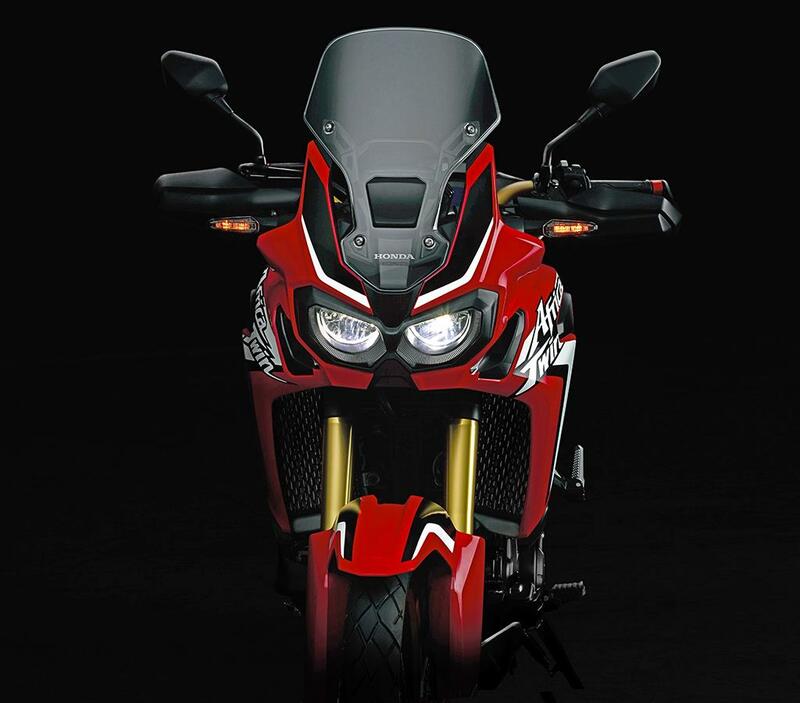 Honda have been the modern pioneer of dual clutch transmissions on road-going motorcycles, and have now sold over 35,000 globally since 2010, but the Africa Twin will be their first truly off-road bike to have the firm’s innovative gearbox as an option. This new evolution of the Dual Clutch Transmission (DCT) has been specifically developed and programmed to provide off-road ability, allowing the rider to concentrate on braking and steering, while the electronically actuated gearbox looks after providing optimum drive to the back wheel. The system will be switchable, allowing the rider to choose gears via buttons on the switchgear, or an optional foot lever, or a fully automatic mode that will do all the hard work and thinking for you. The fact that drive is automatically removed as the bike comes to a stop should also massively reduce the frequency of stalls when negotiating tricky terrain at walking pace, too. There’s no great subtlety in the name Honda chose for their prototype. It was called True Adventure because it encompasses what the new Africa Twin is all about. This is not aimed at the aluminium-panniered Chelsea poseur looking for the appearance of adventure, it’s firmly pitched at true adventure – a bike that can be ridden on road and off it, with near-equal concessions to either terrain, meaning you really should be able to go anywhere. The apparent rush to get our appetites whetted ahead of an imminent launch for the Africa Twin begs another obvious question – where’s the RC213V-S? The MotoGP bike with lights was teased at the same time as its dirty cousin in Milan, and looked just as finished a concept as the CRF, so is the arrival of one an indication that the other is also imminent? MCN believes it is. The industry rumour mill suggests that we’ll see Honda lift the covers off a production-ready RCV at a European round of the MotoGP championship this summer – and possibly as early as next month. There is still no confirmation of the specification of the bike, or the level of bank-heist needed to get one in your garage, but it’s expected that the bike will boast a claimed 200bhp, and a price tag of well over £100,000.